Outdoor activities at Snug Harbour Resort tend to revolve around the beautiful, clean lakes that make Eastern Ontario so unique. Visitors will be glad to know that they have access from our docks to three great lakes: Desert, Birch and Kingsford (see map below). 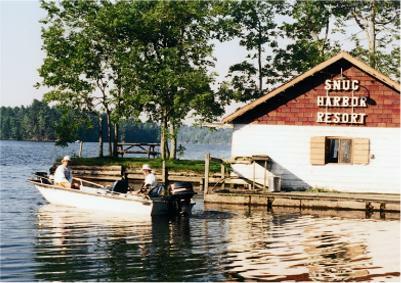 Snug Harbour Resort is situated on Desert Lake at the mouth of Mitchell Creek. Desert Lake is the main lake for all the major water-sports including fishing, canoeing, sailing, water-skiing etc. Fishing is particularly popular at Snug Harbour and Desert Lake is a favorite destination. Its deep, clear, cool waters provide great Lake Trout habitat while several rocky shoals attract bass and pike. For the more adventurous, Birch and Kingsford Lakes can be accessed by a short ride down Mitchell Creek. 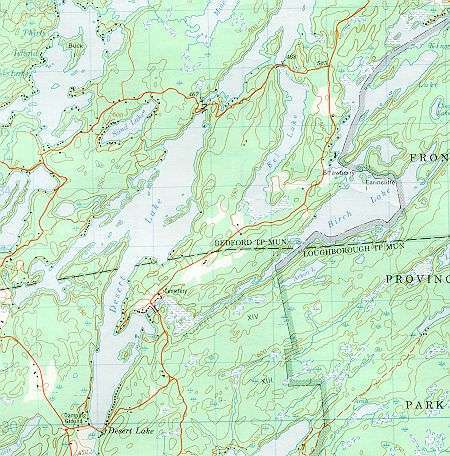 These lakes offer more wilderness oriented opportunities, like hiking and camping, as they border on Frontenac Park. Although there are Lake Trout in Birch Lake, these two lakes are better know for great bass and pike fishing. For some samples of the great fishing on these lakes have a look at our "Great Catches" page.